We’ve recently wrapped another website for a long-standing client, Dr. Sebastian Gonzales, a dentist that runs his practice from two locations. 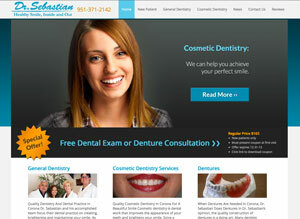 This latest website focuses on his dental office in Corona, CA. The design is meant to mirror his Huntington Beach Dentist website, all of the content was recreated and optimized to spotlight his Corona location.